Aloe africana is a very attractive aloe which adapts to a wide range of conditions. Aloes are characteristic of the African continent where most species occur, but are also found on islands close to Africa such as Madagascar and other adjacent regions such as the Arabian Peninsula. Due to their strong architectural features, beautiful flowers and ease of growth, they are popular all over the world, but mainly grown in subtropical and warm temperate regions. In colder climates plants are grown as house plants or in conservatories. Aloe africana is a solitary plant, bearing an erect stem up to 2 m high (exceptionally up to 4 m), with a skirt of dry leaves. Its leaves, crowded in a dense, apical rosette, are gracefully spreading to recurved, firm linear-lanceolate, up to 0.65 m long, with a grey-green surface, and its margins armed with small, reddish teeth. Flowers are borne on an erect, unbranched to branched raceme. Its beautiful tubular flowers are up to 55 mm long and curved, the latter feature distinguishing it immediately from close relatives. Its winged seeds are formed in dehiscing capsules and dispersed by wind. Flowering time is from winter to early spring (July to September in South Africa). Aloe africana is restricted to the southeastern and southwestern part of South Africa, in the Eastern Cape and Western Cape, and is particularly common near Port Elizabeth, Uitenhage and the lower Gamtoos River. 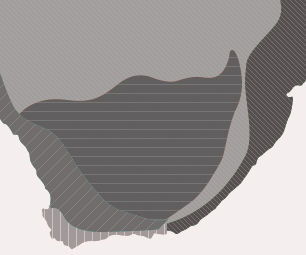 It is mainly confined to hills and flats, growing in thicket and renosterveld vegetation. 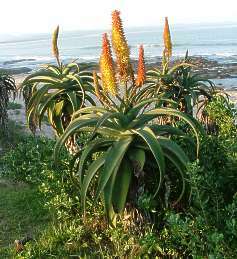 It often grows in association with Aloe ferox, A. pluridens and A. speciosa, and hybrids are not uncommon. Soil is sandy and well drained. The climate is moderate, without frost, and hot and humid during summers. Rainfall occurs throughout the year, from 600 to 700 mm per annum. Aloe africana was grown in Europe from the early part of the eighteenth century, prior to Linnaeus establishing his binominal classification system in 1753. It was named by Miller in 1786. The specific epithet africana pertains to its African origin. Aloe africana, like most other aloes has tubular flowers rich in nectar and pollinated by sunbirds. Aloe africana is easily propagated from seed sown in spring or summer. The plants grow slowly and reach the flowering stage in 4 to 5 years. Sow in a sandy, well-drained potting soil in a warm, shady position in standard seed trays. Germination takes about three weeks. Cover with a thin layer of sand (1 to 2 mm), keep moist and the seedlings can be planted out in individual bags or containers as soon as they are large enough to handle. 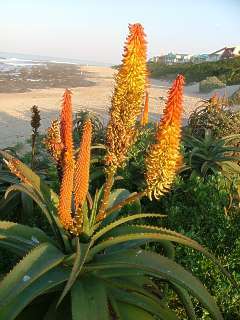 Aloe africana thrives in coastal gardens but also as a pot or container plant. The plants prefer full sun and windy conditions. They are tolerant towards other plant species and often share their habitat with smaller succulent plants. Plants will benefit from compost or any organic feeding. The plants are not frost tolerant but can survive light frost. It thrives in a wide range of soil and even grows well in the winter rainfall Western Cape gardens where it should preferably be moistened during the dry summer months. The plants are fairly pest free, but may occasionally be attacked by the aloe snout weevil. Over-watering will also lead to fungal infections and rot.